Comedy with a kind heart where people make you laugh about stuff that matters. Come belly laugh about ideas that matter. 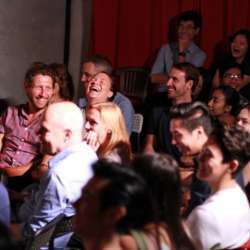 At Sustainable Stand-Up, we teach people to do a highly kind, human, and empathetic form of comedy about ideas that can make the world a better place. This course is the graduation show of our current course participants. Most are performing stand up for the first time. All of them are awesome. 6.30pm to 7.30pm - no break. Show MC'd by course creator Belina Raffy.